U.S. Bureau of the Census. U.S. Census of Population: 1960. Subject Reports, Childspacing. Final Report PC(2)-3B. U.S. Government Printing Office, Washington, D.C. 1968. For persons in housing units at the time of the 1960 Census, the sampling unit was the housing unit and all its occupants; for persons in group quarters, it was the person. On the first visit to an address, the enumerator assigned a sample key letter (A, B, C, or D) to each housing unit sequentially in the order in which he first visited the units, whether or not he completed an Interview. Each enumerator was given a random key letter to start his assignment, and the order of canvassing was indicated in advance, although these instructions allowed some latitude in the order of visiting addresses. Each housing unit to which the key letter "A" was assigned was designated as a sample unit, and all persons enumerated in the unit were included in the sample. In every group quarters, the sample consisted of every fourth person in the order listed. The 1960 statistics in this report are based on a subsample of one-fifth of the original 25-percent sample schedules. The subsample was selected on the computer, using a stratified systematic Sample Design. The strata were made up as follows: For persons in regular housing units there were 36 strata, i.e., 9 household size groups by 2 tenure groups by 2 color groups; for persons in group quarters, there were 2 strata, i.e., the 2 color groups. Although the sampling procedure did not automatically insure an exact 5-percent sample of persons, the Sample Design was unbiased. Generally, for large areas, the deviation from the estimated sample size was found to be quite small. Biases may have arisen, however, when the enumerator failed to follow his listing and sampling instructions exactly. Table E compares rates of children ever born per 1,000 women ever married from the 5-percent sample with corresponding statistics from the 25-percent sample presented in Volume I of the 1960 Census of Population. Differences in this table reflect primarily sampling error. For each of the groups, the ratio of the complete count to the sample count of the population in the group was determined. Each specific sample person in the group was assigned an integral weight so that the sum of the weights would equal the complete count for the group. For example, if the ratio for a group was 20.1, one-tenth of the persons (selected at random) within the group were assigned a weight of 21, and the remaining nine-tenths a weight of 20. The use of such a combination of integral weights rather than a single fractional weight was adopted to avoid the complications involved in rounding in the final tables. In order to control a potential bias in the estimates, where there were fewer than 275 persons in the complete count in a group, or where the resulting weight was over 80, groups were combined in a specific order to satisfy both of these two conditions. These ratio estimates reduce the component of sampling error arising from the variation in the size of household and achieve some of the gains of stratification in the selection of the sample, with the strata being the groups for which separate ratio estimates are computed. The net effect is a reduction in the sampling error of most statistics below what would be obtained by weighting the results of the 5-percent sample by a uniform factor of twenty. The reduction in sampling error will be trivial for some items and substantial for others. A byproduct of this estimation procedure, In general, is that estimates for this sample are generally consistent with the complete count with respect to the total population and for the subdivisions used as groups in the estimation procedure. Yi is the count of persons in the complete count for the area in the same one of the 44 groups. 5For the definitions of Urbanized Area and urban places, see 1960 Census of Population, Volume I, Characteristics of the Population, Part 1, United State Summary. The figures from the 5-percent sample tabulations are subject to Sampling Variability, which can be estimated roughly from the standard errors shown in tables F, G, and H.
These tables do not reflect the effect of response variance, processing variance, or bias arising in the collection, processing, and estimation steps. Estimates of the magnitude of some of these factors in the total error are being evaluated and are being published in reports in Series ER 60, Evaluation and Research Program of the U.S. Censuses of Population and Housing: 1960. The chances are about two out of three that the difference due to Sampling Variability between an estimate and the figure that would have been obtained from a complete count of the population is less than the standard error. The chances are about 19 out of 20 that the difference is less than twice the standard error and about 99 out of 100 that it is less than times the standard error. The amount by which the estimated standard error must be multiplied to obtain other odds deemed more appropriate can be found in most statistical textbooks. Table F shows rough standard errors of estimated numbers up to 50,000. The relative sampling errors of larger estimated numbers are somewhat smaller than for 50,000. For estimated numbers above 50,000, however, the nonsampling errors, e.g., response errors and processing errors, may have an increasingly important effect on the total error. Table G shows rough standard errors of data in the form of percentages. Linear interpolation in tables F and G will provide approximate results that are satisfactory for most purposes. 1To determine the standard errors of data in tables 3 through 18, follow the instructions given later in this section on Sampling Variability. 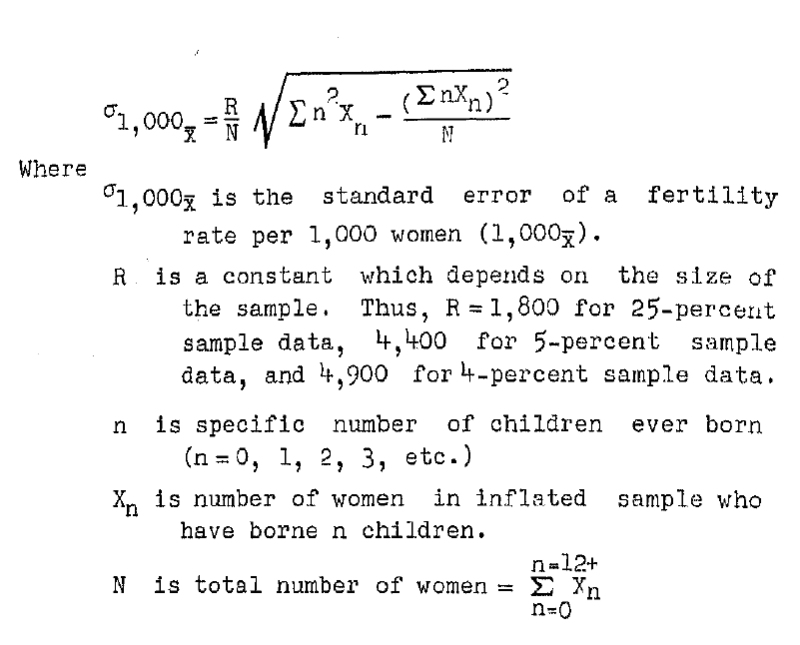 The use of the equation will provide a closer approximation to the standard error of a rate of children ever born than the use of table H. Table H was prepared using this formula and also a regression function relating the distribution of women with 0, 1, 2, etc., children to the total number of children ever born. In any specific case, this regression function is only an approximation. Illustration: Table 20 shows a rate of 1,931 children ever born per 1,000 women by age 28 for 702,892 nonwhite women who were born in 1925 to 1929. Table 20 is based on a 5-percent sample, and table H shows that for an estimate of 1,931 children ever born per 1,000 women when the universe is 702,892 women, a rough approximation to the standard error is about 7 per 1,000. This means that the chances are about 2 out of 3 that a complete census result would not differ by more than 7 from the estimated rate of 1,931 children per 1,000 women. It also follows that there is only about 1 chance in 100 that a complete count could differ by as much as 18-that is, by about 2i times the number estimated from table H.
For a further discussion of the Sampling Variability and of the method for obtaining standard errors of differences between two estimates, see Volume I, Characteristics of the Population. Special instructions for determining the standard errors of data in tables 3 through 18. In the preparation of tables 3 through 18, data were tallied separately for each calendar year and then combined into totals for a 5-year period. Data for a given woman were tallied for a table cell for as many of the 5 years as she qualified for, which means that a given woman may be represented anywhere from 1 to 5 times. The tables of standard errors (tables P, G, and H) are designed for data in which each woman in the sample is represented only once. They may be used without modification for those types of data in tables 3 through 18 that are of such a nature that the woman could have been counted only once, as explained in subsection A below. Special procedures are necessary, as explained in subsection B, for those data in tables 3 through 18 where a given woman may be represented several times in the 5-year period. Examples of one count per woman are data on first marriages occurring in a 5-year period and data on third births occurring in a 5-year period. A given woman can have only one first marriage, only one third child. Another example consists of data for women married less than one year-a given woman can be of that marriage duration only once as of January 1 of some year in a 5-year reference period. Wherever the data in tables 3 through 18 are of such a nature that the event could have occurred only once to a woman, the tables of standard errors may be used without modification. This rule applies to absolute numbers of events occurring in a 5-year period. It applies also to rates when the base of the rate consists of women who could have been counted only once, as in the case of women married less than 1 year as of January 1 of any year within a 5-year period. B. Data involving multiple counting of women. As stated above, data were tallied for each calendar year separately and then combined into totals for a 5-year period. For example, a woman age 14 on January 1, 1955, was counted at age 14 for that date, again at age 15 for January 1, 1956, and again at each later age on January 1 of 1957 through 1959. During the whole 5-year reference period, 1955 to 1959, the woman was counted four times for the broad age group 14-17 shown in table 3 and once for the broad age group 18-19. In contrast, a woman age on January 1, 1959, qualified only once for age group 14-17 in the 5-year reference period. Similarly, other age groups of women shown in tables 3 through 18 involved women who were in the broad age group for varying numbers of years during the 5-year reference period. Rough approximations to the average number of times women were counted as being in a broad age group during a 5-year reference period can be obtained from arithmetic proportions figured on the assumption that there are equal numbers of women in each single-year- of-age cohort. Data of this type appear in table I, in the column "All women." These rough approximations are useful for approximating the standard errors of data involving women of all marital classes, as explained below. However, many of the data on tables 3 through 18 are for women ever married who were of a specified parity and age as of January 1 of each year within a 5-year reference period. Women were counted as many times as they met the specifications. Table I also presents rough approximations to the average number of times women ever married were counted in a broad age group during a 5-year reference period. These rough approximations were developed from a model based on 1960 Census data for women ever married by single years of age. Because they are not specific for parity, the rough approximations tend to overstate slightly the average number of times women ever married were counted in tables 3 through 18. 1 Exception: use 2.9 for ever-married women 15 to 24 years old. 1. Standard error of an absolute number: Divide the number from tables 3 through 18 by the appropriate factor from table I to obtain an estimate of the unduplicated count of women. Read the standard error of the unduplicated number from table F. Multiply the standard error of the unduplicated number from table F by the same factor from table I to obtain the standard error of the number from tables 3 through 18. Illustration: Table 4 shows 5,565 white women in 1955-1959 were age 20-21, childless at 7 or more Years since First Marriage. The standard error of the 5,565 is figured first by dividing 5,565 by the factor of 1.6 shown in table I for women ever married age 20-21. The result of the first step is an estimate of 3,478 for an unduplicated count of women. Interpolation in table F shows that the standard error of an unduplicated number of 3,478 is approximately 231. Finally, the figure of 231 is multiplied by the same factor of 1.6 from table I, producing 370, the desired standard error of 5,565. 2. Standard error of a percentage where the base of the percentage is from tables 3 through 18: Divide the base of the percentage by the corresponding factor from table I to obtain an estimate of an unduplicated count of women for the base. Determine the standard error of the percentage from table G, using the estimated unduplicated number as the base. The result is the desired standard error of the percentage in tables 3 through 18. 3. Standard error of a fertility rate from tables 3 through 18: The procedure is the same as given above for the standard error of a percentage, except that table H is used instead of table G.